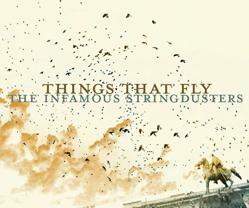 George Graham Reviews The Infamous Stringdusters' "Things That Fly"
The notion of keeping to a strict, pure traditional style of bluegrass has been pretty much out the window for some time now. Starting in the 1980s when artists like David Grisman began mixing the instrumentation of bluegrass with jazz and other styles, about three further generations of artists have been applying their own approach this essentially American style, and further widening the boundaries at each step. This week we have one of those current generation bands who further pushes the envelope while keeping the core of the bluegrass sound. It's the Infamous Stringdusters, whose new third CD is called Things That Fly. This uncommonly large six-piece band, though young, has members who have a good deal of experience in the field, and indeed one, fiddle player Jeremy Garrett is a second-generation bluegrass picker. The banjo player, Chris Pandolfi has the distinction of being the first graduate with a banjo major at the Berklee College of Music. Dobro player Andy Hall has toured with Earl Scruggs and Dolly Parton. Mandolin player Jesse Cobb has performed Jim Lauderdale, Valerie Smith and other bluegrass notables. Rounding out the group are Colorado bassist Travis Book, and their newest member, guitarist Andy Falco, who on this CD contributes to the eclecticism by playing some organ with the group -- not exactly a traditional bluegrass instrument. As on their previous recordings, the Stringdusters play a mix of original songs and a couple of covers, including one by the rock band U2. The group continues their high standard of musicianship, with great picking and first-class vocals. Their singing is also not exactly in the high-lonesome style of the pioneers of the music, but more like a combination of folk and country, with the strong harmonies that bluegrass is known for. There are also some guest vocalists, including country star Dierks Bentley, plus Crooked Still's singer Aoife O'Donovan. With a group this size, all the standard bluegrass instruments are included: banjo, fiddle, mandolin, dobro, guitar and bass. And their arrangements take advantage of that for a strong sound and good opportunities for soloing. In a further departure from the tradition, the group takes advantage of the studio for some effects with sonic atmospherics added, and as mentioned the organ sprinkled in a subtle way, but still noticeable as being out of the ordinary for bluegrass. The group and their co-producer Gary Paczosa, who also worked with Nickel Creek, use the effects tastefully. Things That Fly the new third CD by The Infamous Stringdusters is another first-rate recording by one of the bright lights on the new bluegrass scene. The six-member group includes all the standard bluegrass instruments, and all the players are impressive pickers. Their songwriting is also top-notch. They explore some degrees of eclecticism in terms of their sound, and further expand the boundaries of bluegrass with their more involved use of the studio and including a little organ in their arrangements. They result is creative and tasteful. But for our grade for audio quality, we'll give the CD no better than a C-plus. The added studio effects are do work nicely, but the overall recording suffers badly from excessive volume compression, to the point that there are instances of so-called clipping distortion, caused by cranking up the sound to the point where it breaks up. And for some reason, the U2 cover In God's Country is in mono. Bluegrass continues to be a place where lots of fine musicians are gravitating. While you can still find practitioners of the old traditional style, the field has become wide open for artists to follow their own paths. The Infamous Stringdusters are certainly in the latter category, and they are some of the best around.